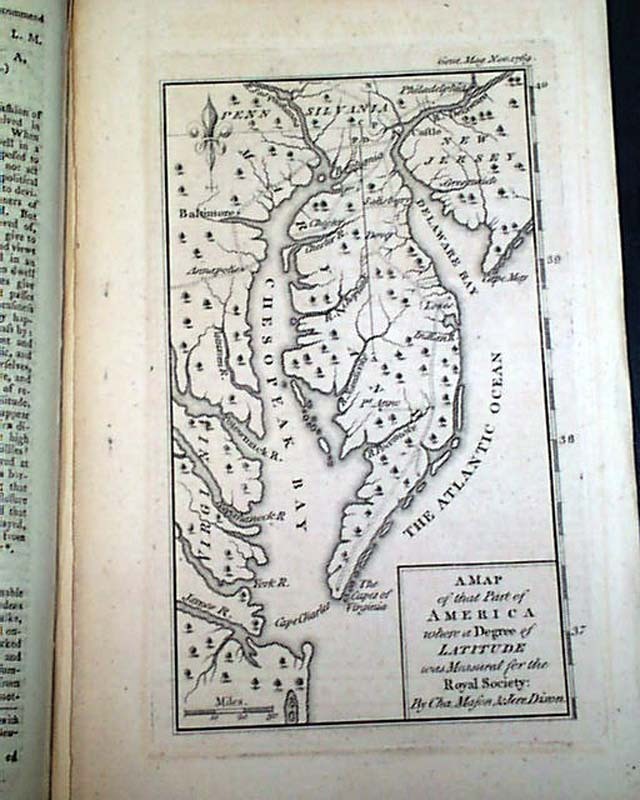 Certainly the prime feature of this issue is the nice full page map of the Chesapeake region showing parts of Virginia, Maryland, Pennsylvania, New Jersey, and all of Delaware. 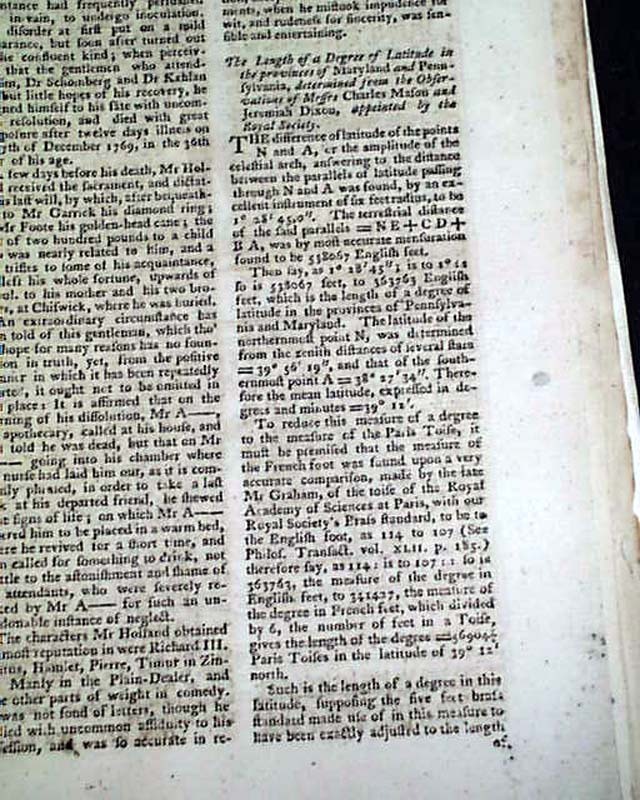 The inset in the lower right corner reads: "A Map of that Part of America where a Degree of Latitude was Measured for the Royal Society: By Cha. Mason, & Jere. Dixon." This map has a companion article titled: 'The Length of a Degree of Latitude in the Provinces of Maryland and Pennsylvania, determined from the Observations of Messrs. Charles Mason and Jeremiah Dixon, appointed by the Royal Society" which takes nearly two columns of text. These gentlemen are the famed "Mason & Dixon" whose names are synonymous to this day with the border between Pennsylvania & Maryland, which was also used to divide the North & the South during the Civil War. The map measures 5 1/2 by 8 1/4 inches & is in very nice, clean condition (see). 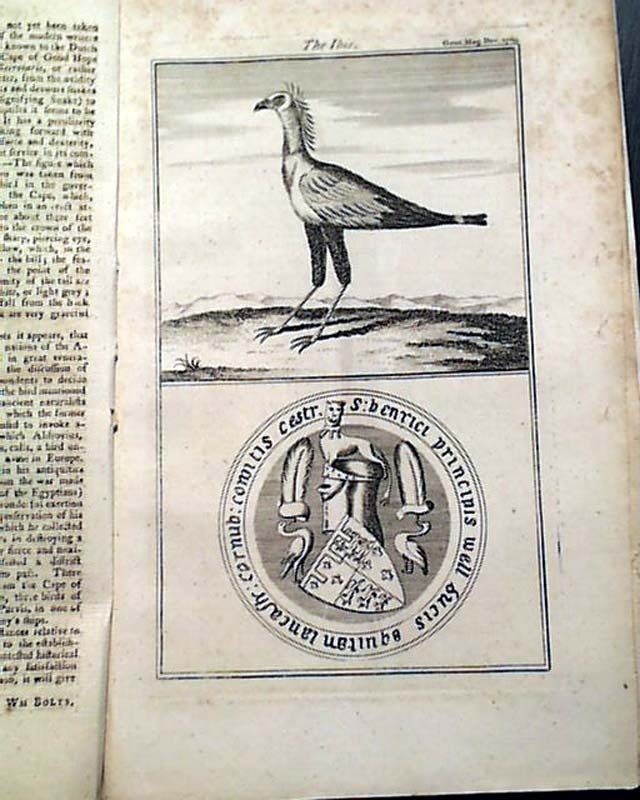 Among the other articles in this issue are: "Description of a Curious Bird" which related to the other plate in this issue which includes a print of: "The Ibis" (see). 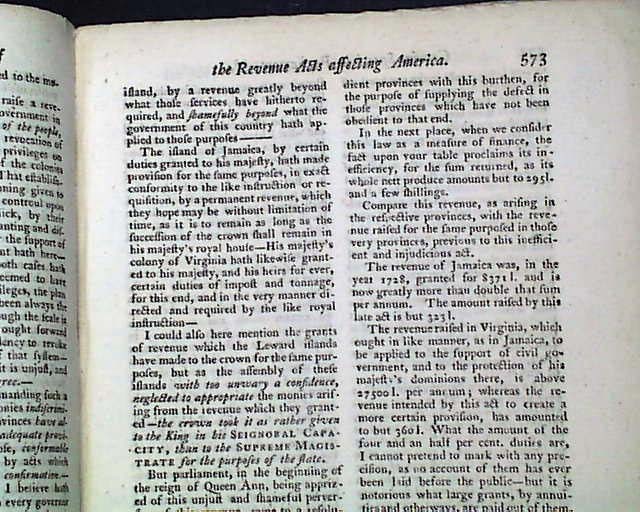 Also: "Extract of a Letter from Philadelphia in North America..." "Genuine Speech in Parliament in Favour of the Americans" "The Revenue Acts Affecting America" and more. Both plates called for are present. 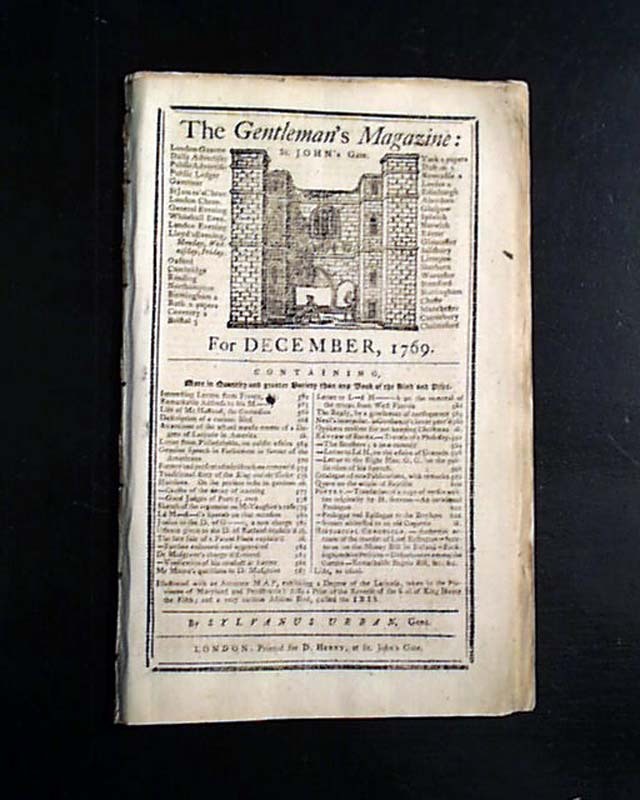 Complete in 48 pages, 5 1/2 by 8 3/4 inches with wide untrimmed margins, full title/contents page with an engraving of St. John's Gate, very nice, clean condition. 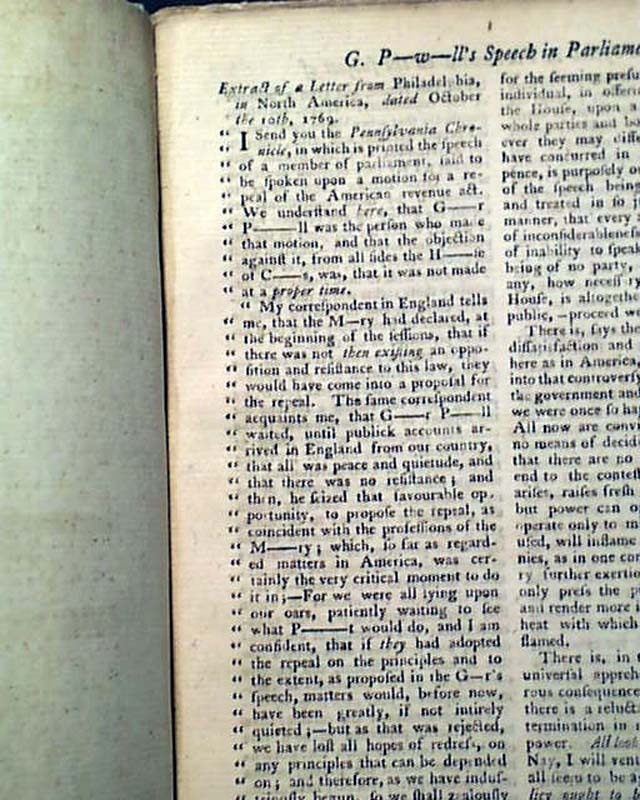 A very nice pre-Revolutionary War magazine from the "mother country" with a wide range of varied content.This was the first periodical to use the word "magazine" in its title, having begun in 1731 and lasting until 1907.